The Japanese government yesterday agreed to provide $400,384 in grant to improve maternal and child health in Takeo province. 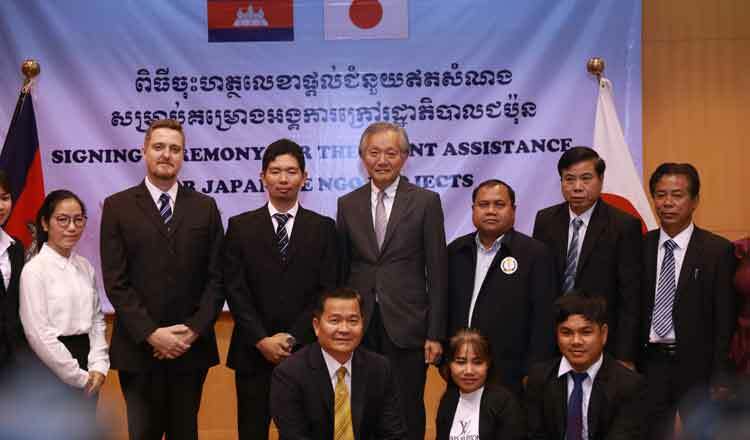 A grant contract was signed between Hidehisa Horinouchi, Japanese Ambassador to Cambodia, and Takuya Matsuoka, project Manager of World Vision Japan at the Japanese Embassy. In the project, World Vision Japan will provide training for health workers and volunteers and also provide health education for mothers. It will also establish Community Health and Nutrition Boxes which will enable poor families to have access to medical services in the Kiri Vong and Koh Andet districts in a bid to reduce the number of malnourished children and spread of water-borne diseases. The project also includes the construction of water and sanitation facilities at seven health centres in the two districts to improve the medical environment. Mr Horinouchi said that World Vision Japan will train health centre staff and provide health education to the mother by establishing a community health and nutrition centre so that poor families can access health services and also improve sanitation and hygiene systems at health centres. “Through this project, I expect that good knowledge about health will be promoted and maternal and child health conditions will be improved and safe water access will be promoted,” he said. Mr Matsuoka said that information on maternal and child health has been widely disseminated in 290 target villages from the provincial level to the community level through training and awareness sessions. “Parents and guardians also learnt the importance of the first 1,000 days of childhood and prepare nutritious food for children,” he added.